Earphones should be good for more than just piping sweet, sweet music to your ears. While they bring jams to you, they should also keep unwanted noise out. Hear your music how it’s supposed to sound—clean, clear and just how you like it. We at Comply know what you crave when it comes to your listening experience, whether you’re a total audiophile or just want to block out the sounds of the world on your daily commute. 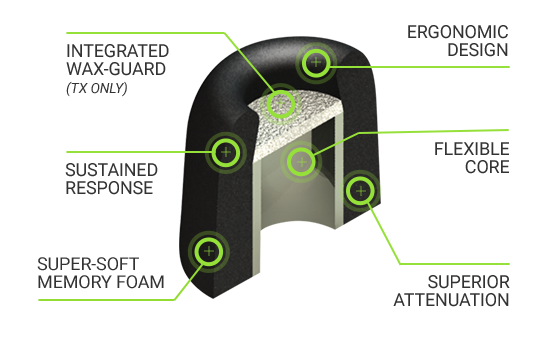 That’s why we developed Isolation Series Foam Tips. Isolation Series earphone replacement tips have been expertly developed for noise isolation—that means say “goodbye” to distracting outside noises that steal from the quality of whatever you’re listening to. With total isolation, you can listen to your music at a comfortable level instead of bumping the volume up with each new noise. Intended for athletes seeking to drown out the world before a big game, musicians hoping to capture the essence of their music, and the everyday listener who would rather hear their playlist instead of every conversation on the bus, the Isolation T-500 and Tx-500 Series are made for you. Maximum Noise Isolation: You heard correctly. Maximum. Noise. Isolation. With two-times more decibel reduction than silicone eartips, you’ll be able to play your music at a comfortable level since sound isn’t getting lost and distracting noise isn’t being let in. The decibel reduction is achieved through making an eartip that is 10 times thicker than the standard tip. So while we can’t make your apartment walls thicker to block out your noisy neighbors, we can at least make eartips capable of doing just that. Superior Audio Experience: These tips were designed to create the perfect ear canal seal. By funneling sound into your ear while sealing out noise, you’ll experience enhanced bass and crystal clear highs. Secure In-ear Fit: This patented viscoelastic memory foam has a serious grip—100% better grip than silicone, that is. Isolation 500 tips are also body heat-activated, which means they’ll only hold tighter as they respond to your body temp. Extreme Comfort: We made this foam 30 times softer than silicone rubber, so while your ear canals might have felt fatigued or achy after only an hour or so of listening before, now you can listen all day without feeling a thing. WaxGuard™ Protection: Our patented WaxGuard™ is our innovative acoustically transparent filter that sits inside the earbud’s tip. In addition to keeping external sound out, WaxGuard™ now enables you to keep earwax and other debris clear from your earphone’s soundport. Comply’s Isolation Series Tx-500 tips integrate WaxGuard™ into the tip while our T-500 lineup does not include WaxGuard™. Ready to hear music how it was intended? Get your hands on Isolation Series T-500 and Tx-500 earphone tips. Have questions? Let’s chat! We’re always willing to answer questions and tell you more about how Isolation 500 replacement earphone tips will change how you hear music forever. These are no ordinary earbud tips. These earbuds are the result of intensive ear canal research. After developing the world’s first FDA-approved cochlear implant, the founder of Comply™ started creating numerous patented memory foam solutions to protect and enhance hearing, including the first memory foam earphone tip. Since this chronic inventor’s first earphone tip replacement, Comply™ has expanded its offerings to hone in on different listening desires, such as external sound isolation.